For the month of February, we’re doing double duty between Women in Horror and Black History Month. This week, for our first foray into Black History Month, we decided to go big. 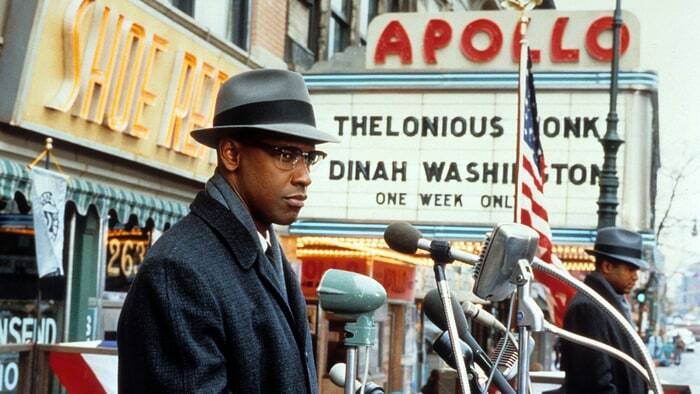 We’re talking about Spike Lee’s 1992 epic Malcolm X and Ava DuVernay’s stunning Selma from 2014. We talk about the different approaches DuVernay and Lee took to represent each of these invaluable men, and their contributions to society and history. From Lee’s broad, sweeping biopic spanning the entirety of Malcolm X’s life, to DuVernay’s narrow focus on Martin Luther King Jr.’s influence and the march from Selma to Montgomery, Alabama, we’re looking at what sets these films apart, and what makes them both essential viewing year-round, and now especially. Don’t forget until February 26th, all proceeds from Tina Hassania’s book on Asghar Farhadi are going directly to the ACLU. You can pick up your copy through The Critical Press. And be sure to check out some excellent new podcasts from Dawson McManus with 646, and Jamie Dew’s upcoming A Show Of Strength. We’ll be participating in CAMH’s One Brave Night to End Mental Illness with Jamie and his team, A Show Of Strength, so please donate either to us directly, or to the team. It’s all going to the same place, and the same excellent cause! Check out Changing Reels as well, a fellow Modern Superior podcast with lots of wonderful perspectives to offer. Courtney Small and Andrew Hathaway showcase diversity in front of and behind the camera, and select films that they feel don’t get enough love. Follow us on Twitter, Facebook, and Instagram, or shoot us an email at aframeapartcast@gmail.com. Tune into the show every week on iTunes, SoundCloud, Stitcher, Google Play, and the Pocket Casts app. Like us, follow us, subscribe, and leave us a review wherever possible. We’ll read them on the show!